Many terrarium enthusiasts site their love of imagining themselves shrinking down like Alice in wonderland and exploring their own miniature landscapes. This escapism often leads to whimsical designs complete with toadstools, mock fairy doors and gnome clotheslines. But what about the more sinister side of existing under glass? What if Sylvia Plath had decided to build a terrarium under her bell jar? 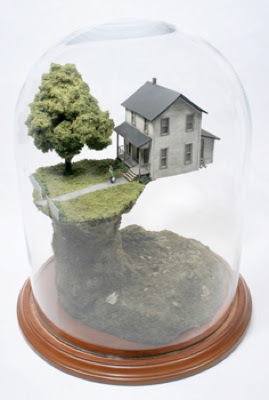 I think the end result would land somehwere near Thomas Doyle's eerie terrarium dioramas at boingboing.net. The unsettling scenes of loss and danger are painstakingly arranged and often sealed under glass- illustrating the claustrophobic effect of the disasters in miniature. What fun, with a point. thanks for this - very interesting! This diorama art is a bit different from what I'm used to. I love it, though! Beautiful work!